Without doubt, pain is a common occurrence in human living. Many people are plagued by one form of pain or another, and they seek various methods to bring lasting relief to their situation. Most times when you feel pain, there is an associated inflammation responsible for the pain. Consequently, most treatments for pain are made to attack the underlying swelling. That said, top on the list of pain-relieving and inflammation remedies are over-the-counter medications like ibuprofen and diclofenac. Exercise, meditation, and acupuncture are other methods of treating pain problems. However, while conventional treatment options for swelling and pain are effective, they sometimes come with unwanted side effects. As a result, many people are looking at alternative remedies that are as effective, but do not come with the side effects. 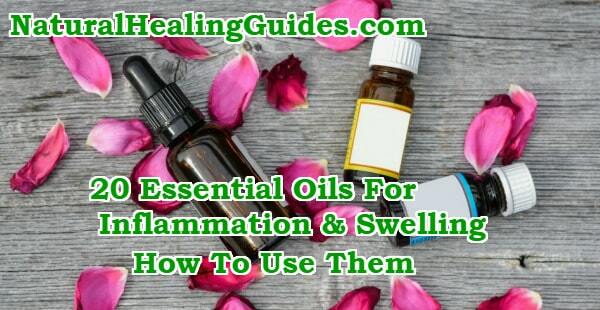 In this article, we take a look at 20 essential oils that you can use for treating inflammation and pain. Before that, let us take a quick look at essential oils generally. Basically an essential oil is any liquid extract from a plant. An essential oil can be gotten from any part of a plant, but the leaf is the most common source. Essential oils usually have the same aroma or flavor as their parent plant and can be used as medicine. Now that we are done with that, let’s get into the meat of the matter! Below are 20 essential oils that you can use for treating pain and in reducing inflammation in the body. The first on the list is thyme essential oil. This oil has so many health properties including anti-inflammatory, antispasmodic, and sedating effects. The combination of these properties makes thyme oil a great remedy for pain and inflammation. Mix 2 to 4 drops of thyme essential oil with a teaspoon of coconut oil and apply topically on an aching skin to relieve the pain, or inhale the aroma of the oil after slightly heating. Another yet effective method is to soak in bath water with some drops of the oil poured inside. Besides its culinary use, rosemary oil is popular in natural medicine due to its many health properties. People suffering from headaches or arthritis can benefit from the use of rosemary essential oil. For arthritis, you should massage the joints with the oil, while you can breathe in the vapor of the oil to relieve a headache. Lavender essential oil is a popular ingredient in aromatherapy. The pain-relieving and anti-inflammatory properties of this oil can help to bring numbness to an aching body part. To use lavender oil for pain relief, dilute the essential oil in a carrier oil and apply topically on the pain region. You can also drip a few drops of the oil into your bath water and soak in it before going to sleep. Flaxseed essential oil contains healthy omega-3 fatty acids, which have been proven to have anti-inflammatory effects. Dilute a few drops of flaxseed oil in a teaspoon of olive oil and massage the affected area to reduce pain caused by inflammation. Peppermint oil is one of the oldest essential oils used for medicinal purposes. Among other health properties, the analgesic properties of peppermint oil can help in pain and inflammation treatments. Headache, back pain, and stomach ache are some of the pain problems that can be treated with peppermint oil. Simply massage the affected area with the oil to bring relief. Derived from cayenne pepper, this oil works just as much as the hot pepper. And like the pepper, this essential oil also contains capsaicin, which is the main source of the anti-inflammatory and analgesic properties. You can massage an aching joint with cayenne pepper essential oil after first diluting in a carrier oil. According to research, rosehip oil can help in the treatment of joint pain because of the antioxidants and anthocyanins it contains. This essential oil is also beneficial to people who cannot use over-the-counter pain-relief medications. Thus, you can benefit from rosehip oil if you do not fancy any of the common OTC drugs out there. Lemongrass oil has pain-relieving properties that can benefit people suffering from various types of pain. The astringent properties of lemongrass essential oil also help to prevent the swelling from spreading. The pain-relieving benefits of the oil can be experienced by massaging the body with the oil. In case you don’t know, ginger is more than a kitchen ingredient. Ginger is one of the many kitchen spices that also finds use in natural medicine. The liquid extract from ginger root has been shown to be an effective remedy for many pain-related problems. A great advantage of using ginger oil is that it can be used both internally and externally, and does not have any adverse side effect. So, if you are searching for a great remedy for arthritis or lupus, you should seriously consider using ginger oil. One interesting thing about clove essential oil is the fact that it has an anti-neuralgic effect on the skin when applied. This means that it creates a feeling of numbness on the skin for a while after it has been applied. A good application of this oil is in the treatment of tooth ache. For this, drip a few drops of clove oil into a ball of cotton and apply on the pain-affected area. Sandalwood oil is gotten from the tree of the same name. It makes this list because of its powerful anti-inflammatory and antispasmodic action on pain. To benefit from sandalwood oil, simply use a diffuser to spread the oil. A downside of this oil, however, is its high price tag; sandalwood is regarded as one of the most costly essential oils. Extracted from the leaves of the eucalyptus tree, eucalyptus essential oil is another potent pain relieving oil. Its anti-inflammatory effects on swelling can help in the treatment of pain due to inflammation. All you have to do is to dilute the oil in a carrier oil and apply on the pain region. Unlike the Roman chamomile oil that is used for treating stomach upset in children, the German chamomile oil is more suited for pain relief. This is due to the presence of chamazulene, which is the source of the anti-inflammatory effects of the oil. Topically apply chamomile oil on the affected area and leave to dry. This oil is a product of the nosebleed plant. It is effective in treating pain conditions because of the presence of salicylic acid – the major source of the oil’s anti-inflammatory effect. Apply yarrow oil on the affected area to relieve the pain and reduce the swelling, if any. This essential oil is particularly beneficial to women who are experiencing PMS (premenstrual syndrome) symptoms like abdominal cramps. Other benefits of the oil are found in the treatment of breast pain and the symptoms of menopause in women. To reduce pain due to cramping, you can massage the abdomen with the oil after previously diluting. Although the primary health benefit of clary sage oil is in the treatment of eye problems, it can also be used as a natural pain reliever. Abdominal pain and headaches due to stress can be treated using this essential oil. It needs to be stated here that clary sage oil should never be ingested due to its potency. Instead, it should be applied topically on the skin, or sprayed using a diffuser. The wintergreen plant is a North American shrub with shiny leaves and white bell-shaped flowers. The oil is gotten from the leaves and has been used for many years as remedy for gastrointestinal problems. Since then, the use of the wintergreen essential oil internally has been discouraged due to findings about its toxic nature. If you have a headache, or muscle spasms due to neuralagia, you can apply this oil externally to reduce the pain. Known to the Ancient Greeks as “the joy of the mountains”, marjoram is a popular European herb used as natural medicine for various health issues. The oil has remarkable analgesic properties. Pain due to toothache or headache can be relieved using this oil. Besides, marjoram oil has antispasmodic properties that should benefit you if you are experiencing muscle spasms. You can use juniper essential oil as a remedy for pain and swellings by massaging the pain-affected region with the diluted oil for about 10 minutes. Alternatively, you can dribble about 15 drops of the oil into your hot bath water and soak in it for about 30 minutes. Note, however, that juniper oil is highly potent and should not be used by expecting mothers and children younger than 4 years of age. Last, but by no means the least, is helichrysum essential oil. This oil is another effective natural pain relieving remedy. The oil can be applied on the skin to reduce pain due to bruises and sunburn. Helichrysum oil is also used in the treatment of rheumatism as it helps in bringing lasting relief to aching joints. In Ayurvedic medicine, frankincense essential oil is used in the treatment of several health conditions. This is not unrelated to the oil’s many beneficial health properties. Like most other essential oils in this list, you can benefit from the use of frankincense oil in various ways. You can either apply the oil topically on the skin and massage, or you can breathe in the soothing vapors. Note: It is necessary that you dilute an essential oil in a carrier oil before applying topically. This is to prevent any skin irritation. The normal ratio of mixing is 2 to 4 drops of essential oil with 1 teaspoon of carrier oil. Common carrier oils for this purpose are castor oil, olive oil, almond oil, and coconut oil. Inflammation and pains can be really discomforting; thus, people are always trying one product or method after another. With the above-listed essential oils, you should say goodbye to your pains. And while there are lots of essential oils out there, we have decided to look at only the above 20. This means that there are many other essential oils that you can try if you are unable to get hold on the ones here. Also, you need to be aware that not all oils may work the same way with you.